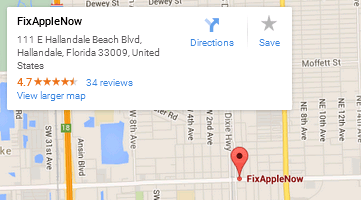 Below you can find driving directions from Google Maps to help you get from Surfside to your nearest Fix Apple Now store, situated in Hallandale. You can either copy the driving instructions below or click here for a larger map and driving directions. Do you need to mend, fix, replace or restore your iPhone 4,5 or 6, iPad, iPad Mini, Mac Mini or MacBook Air or Pro in Surfside? If so, take a look at Fix Apple Now. We have vast experience when it comes to delivering the solutions our customers are looking for and what's even better is that we can offer some of the best prices for Apple repairs in the area too. We can deal with a whole host of problems, including devices not turning off or on, cracked or frozen screens, bent iPhone 6 handsets, enlarged icons and crackling noises. Get in touch with us today if your Apple device isn't quite working as it once did. We can bring you the results you're looking for, and our engineers are amongst the very best in the business. We are confident you won't find a better service elsewhere if you need an Apple repair service in Surfside, so why not contact us as soon as you can?